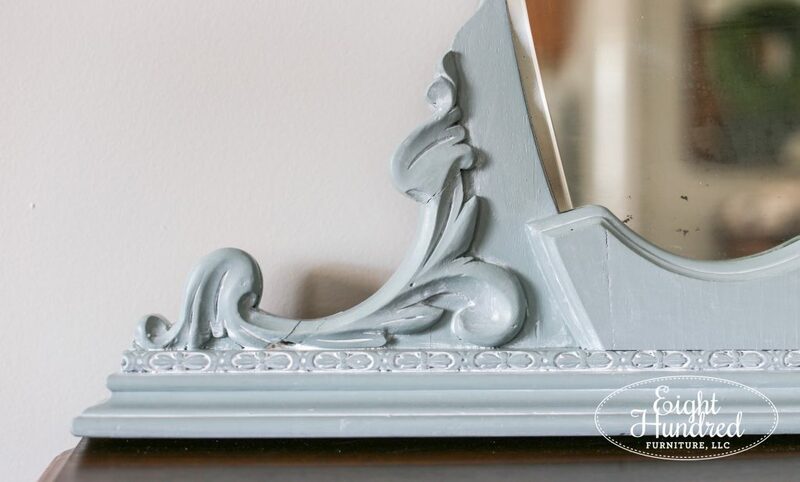 What is General Finishes Milk Paint? Last week was incredibly busy! On Friday, we met a delivery truck over at Morgantown Market to receive my opening order of General Finishes products. We unpacked it and set up my new display in my antique booth. I’m so proud and excited to be able to offer this high-quality product line to my customers, and I wanted to take some time to introduce you to the main product in the collection – General Finishes Milk Paint. Now you’re probably wondering why I’m carrying two types of Milk Paint. I promise that by the end of this post, you’ll have the answer to that question! You may also be wondering how General Finishes Milk Paint is different from Miss Mustard Seed’s Milk Paint. I promise I’ll address that specific topic head on in a separate full-blown comparison of the two lines. 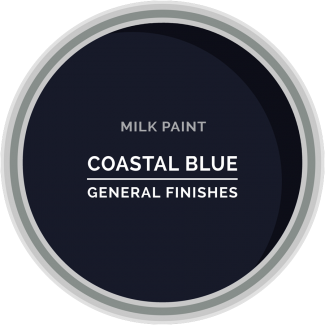 For the purposes of this blog post, I’d like to focus on what General Finishes Milk Paint is and some of the wonderful features it offers. 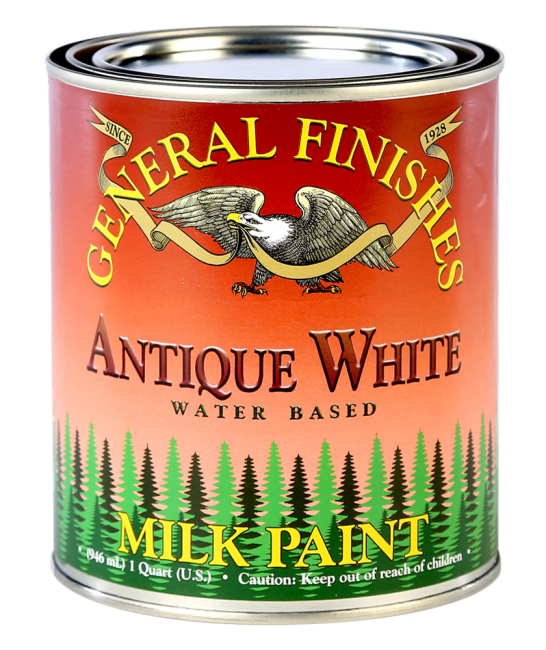 If you’ve never heard of General Finishes, let me enlighten you on the company first. GF is an American company based out of East Troy, Wisconsin. They manufacture, support, and distribute their products right here in the USA, hence the eagle on their logo. Personally, I have found that to be 100% true in my interactions with GF on social media, Facebook, on the phone, and now from the retailer side. 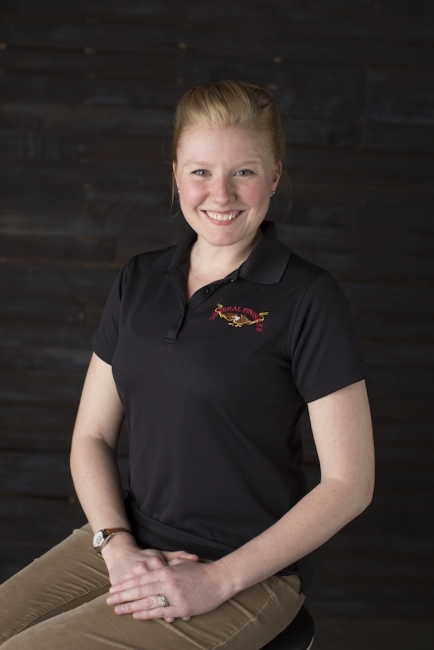 You can meet their team here, and I have to give a shout-out to my girl, Shannon. She was amazing in getting me off the ground and she supported me all the way through the startup process. It’s so nice to know that there are actually real people on the other end of the phone or computer and I can see their faces on the GF website. Their team is small compared to a big corporation, but I like that! Small equates to personal one-on-one attention, which means the world to someone like me! Now that you know a bit more about the company, let’s dive into their version of Milk Paint. 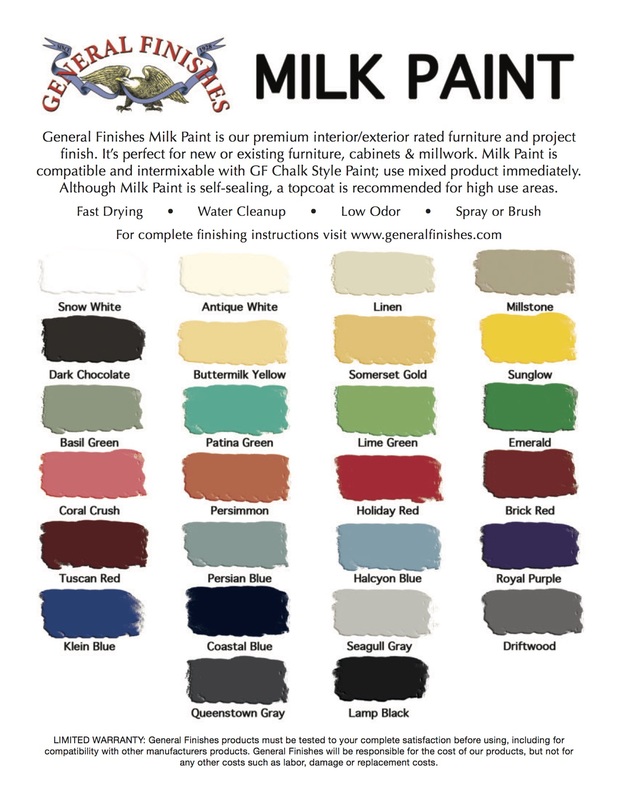 To begin, General Finishes Milk Paint is not a true Milk Paint (like Miss Mustard Seed’s). It does not contain any casein-based ingredients and it does not come in powdered form. It’s an acrylic based paint that was given the name “Milk Paint” because it mimics the low luster sheen of original milk paint. GF wanted to put a clear, bright, contemporary spin on this old-fashioned furniture paint tradition. So just to be clear, it’s called Milk Paint because when it dries, it has the appearance of traditional milk paint, but it’s not actually a true milk paint. GF’s Milk Paint is pre-mixed and it comes in liquid form. To use it, all you have to do is prep your piece, stir the can and get started! That’s one of the major reasons why I brought it on. 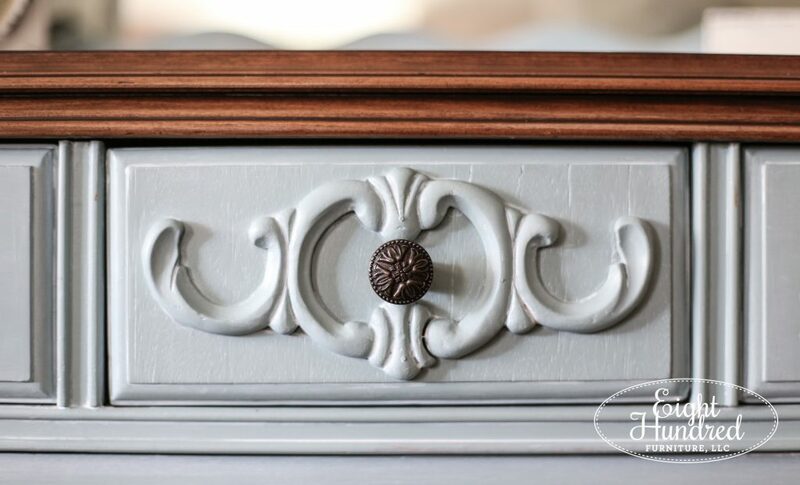 I wanted to offer my customers a pre-mixed alternative to Miss Mustard Seed’s Milk Paint. I’ve been looking for a liquid line to carry for a while, and General Finishes has been high on my list since I started considering bringing on a second line of paint over a year ago. Even though GF’s Milk Paint is pre-mixed and comes in liquid form, it does not equate to “no prep”. If you caught my statement in the paragraph above, you first prep your piece, stir the can and then get started. You should always prepare your piece to receive a new finish because if you don’t, you greatly increase the risk of a failed finish. 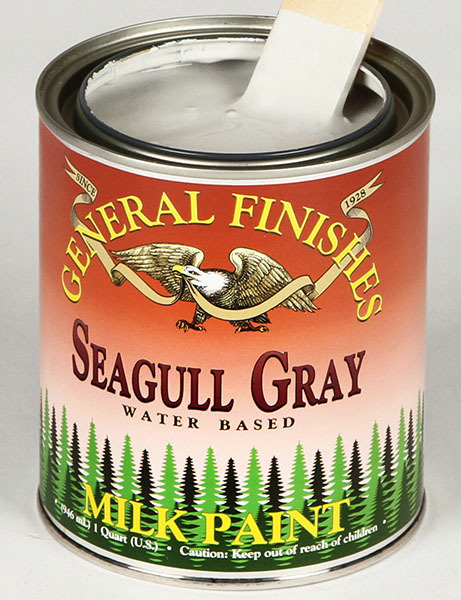 The basic prep process for applying GF’s Milk Paint can be found by watching the video below. GF’s Milk Paint has the consistency you would expect from a modern paint and it is not thin like a true powdered milk paint. It is self-sealing and is extremely durable. No additional sealer is required on pieces that will receive low to medium wear. If extra durability is needed for high use pieces (like kitchen cabinets, kitchen tables, benches, or table tops) you can apply their water based High Performance Topcoat over their Milk Paint. It is milky white in appearance and dries clear to flat, satin, semi gloss, or high gloss sheens. There are no wax topcoats in this product line. There are several shades of glazes that you can add that would give you the same look as a white wax or an antiquing wax. They look great on pieces that have carved detail work. GF’s Milk Paint has excellent adhesion properties. There is no random chipping and it is a full coverage paint. The only time chipping would occur is if the finish failed due to improper prep or inadequate dry time. If you like the full coverage look, consistent color throughout your project, and a smooth modern finish, then GF Milk Paint is right up your alley! 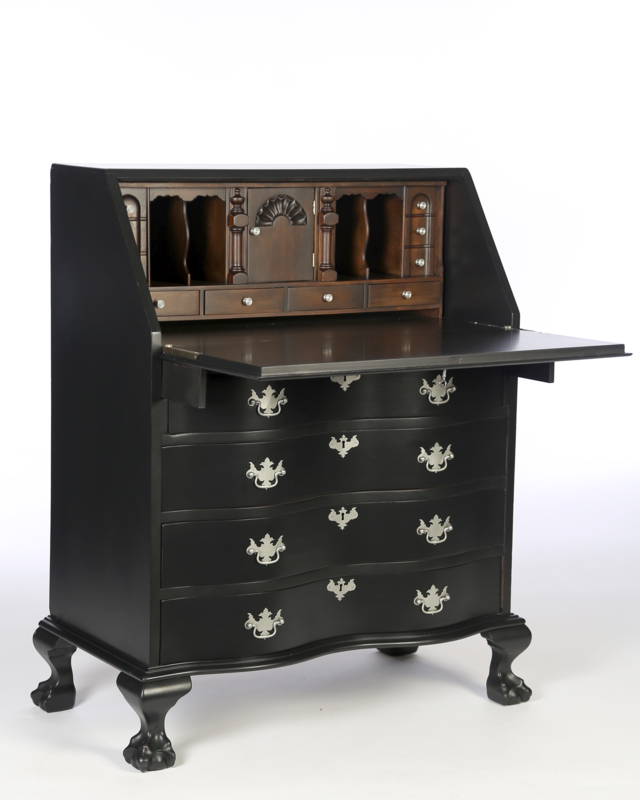 Here is an example of Lamp Black Milk Paint sealed with High Performance Satin and Cherry Dye Stain on the interior. See how the finish is full coverage with no chipping? The color is consistent and there is just the slightest hint of a shine. GF’s Milk Paint also can be used for outdoor projects. It’s UV resistant, water resistant and scratch resistant. Plus, it sprays beautifully! The Exterior 450 finish can be applied on pieces that will have high exposure to the elements. GF’s Milk Paint comes in 26 lovely colors. Currently, I’m carrying half of them, and I’ll be adding more as time goes by. If you would like to use a color that I don’t currently offer, simply ask, and I will special order it for you! GF’s Milk Paint is safe to use indoors and is low odor. That’s music to this furniture painting girl’s ears! It is easily cleaned off from brushes with water and mild dish detergent. You can watch this video to see how easy it is to apply GF’s Milk Paint by using a paintbrush. There is a 20-30 day cure time with GF’s Milk Paint, which is pretty much the industry standard. This does not mean you cannot start using your piece once dry. It simply means you should be gentle with it until it has completely cured. To clean pieces that have been finished using General Finishes, use a water dampened rag to clean and wipe dry. Be sure to wipe up spills quickly and always protect your finish against heat and water damage by using coasters and trivets. Do not use furniture polishes such as Pledge or dusting sprays like Swiffer. These products will make it very difficult to refinish the piece in the future. Like I said, I’m so excited to bring this line to Morgantown Market and there will be demonstrations and workshops being offered soon! My first retail project that I’m planning is a vintage waterfall dresser. I’ve already stained the drawers with GF’s Antique Walnut Gel Stain, and I plan on painting the body with Coastal Blue. 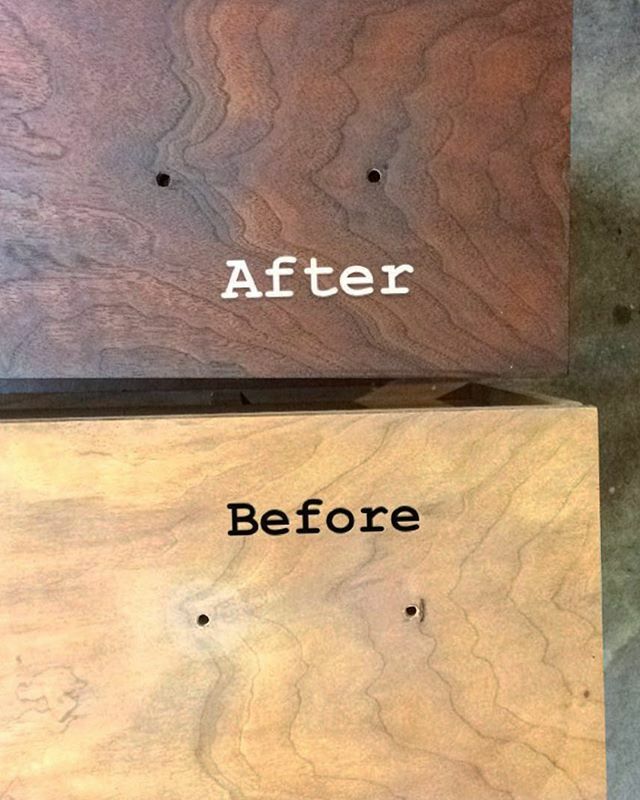 You can see the before and after photo below showing how Antique Walnut Gel Stain woke up the gorgeous grain on the drawer fronts. So stay tuned for upcoming demos and workshops here on my website and on my social media feeds. I can’t wait to show General Finishes in action!